This is another of my mom's old records - one with which I'm very familiar. And, as a result, I'm a big fan of Ray Conniff. I find that I am listening a lot to my mom's old records lately. They bring a sense of comfort and and overall good feeling to me. Although my mom has been gone for 16 years now, I know she is always with me, and I especially feel that when I'm listening to her records. And since Sundays are usually family days (at least they were when I was growing up), then today is a good day to post this record. 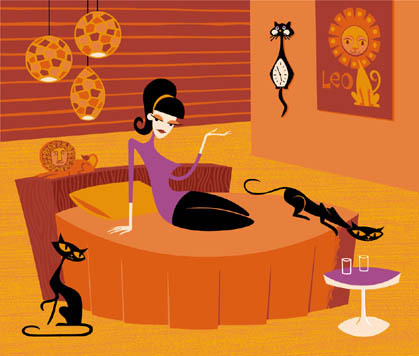 Here's another from my "celebrity vocals" collection. I absolutely adored Walter Brennan in all the westerns and Disney movies he was in. Of course, he didn't really sing on his albums... he spoke the lyrics with the music as background. I guess you could say he was "rapping" - wow, he was a "rap" pioneer! Who knew? Anyway, I really do like listening to Walter's albums. Some people might say they're pretty corny, but I like corny. And you can bet that some of the songs, like "Old Shep", bring a tear to my eye. ("Old Rivers" makes me cry every time!) 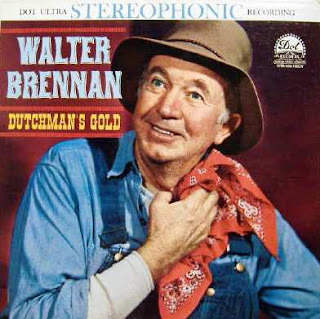 I think one of the reasons that I like Walter's albums is that they remind me of simpler times. I'm often nostalgic for simpler times. Sigh. Something of note for this album is that the orchestra and chorus were conducted by Billy Vaughn! Time for another "celebrity" vocal. This time it's Johnny Whitaker, who starred as adorable Jody Davis in the television series "Family Affair", and later starred in the Sid and Marty Krofft Saturday morning show "Sigmund and the Sea Monsters". He also starred in several movies such as Disney's "Napolean and Samantha" with Jodie Foster, and the musical "Tom Sawyer". This is another gem I rescued from the HPB bargain bin solely for the cover. Those are America's most famous models from back in the day - Sunny Harnett (standing behind piano), Gita Hall (leaning on Joe), Nancy Berg (the one practically lying down in front of Joe), Suzy Parker (lying on top of the piano), and Ginny Taylor (standing on the right of the piano). The only one I ever heard of was Suzy Parker, who was also an actress and was married to actor Bradford Dillman (who I love). Suzy Parker was also the first model to earn $100,000 per year. Anyway, this is a lovely "mood music" album - very soothing piano "against a rich orchestral backdrop". Give it a listen! Here's another of my Jackie Gleason albums (I have several more that I will share as time goes on). I really enjoy the Jackie Gleason albums. They always have familiar songs and arrangements that I like, and the covers are usually pretty swell! 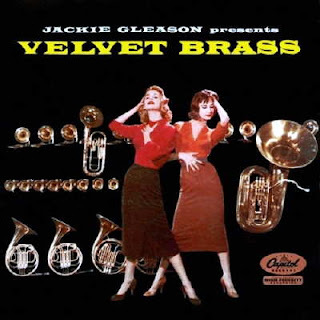 So, without further ado, here is "Velvet Brass" - enjoy! 1. You're Driving Me Crazy! 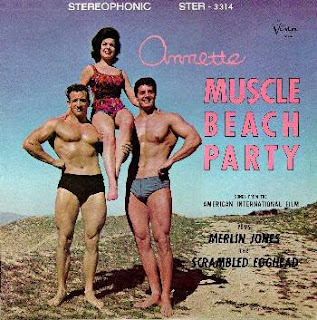 This is another of my mom's old albums. I definitely remember hearing this one a lot when I was growing up. Even now, when I hear the first notes of "Ciribiribin", memories of my childhood and my mom come flooding back. Those were good times. My mom loved big band music (that was her "era"), and her favorites were Glenn Miller and Harry James. But I think Harry was her particular favorite. And now, thanks to her influence, Glenn and Harry are my favorite big band leaders, and Harry is my particular favorite. I'm also a big fan of his female vocalist, Helen Forrest. "It's Been a Long, Long Time" just gives me chills - I love it so! I think my mom's favorite was "You Made Me Love You", because she marked it on the back of the album as if highlighting it. 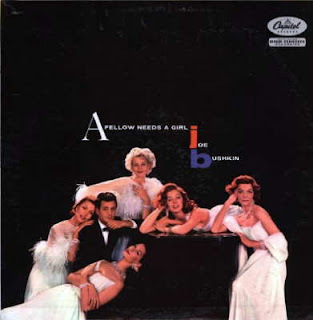 And, although this album was released in 1955 (all selections were recorded in July 1955), my mom didn't buy it until 1959 (she had a habit of dating her albums as to when she got them). Anyway, this is one of my favorites - and my mom's. Hope you like it, too. This is yet another album I rescued from the HPB bargain bin - and it was the title that caught my eye. I will buy just about any album that has the word "bongos" in the title - I love bongos! And this was just such an odd title that I couldn't resist. I love the music, too! 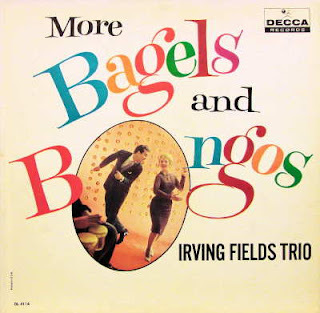 According to the liner notes, there was a prior album titled "Bagels and Bongos" (anyone have it to share?) and these are Yiddish songs to a Latin beat. What a great idea! I read on the Internet that Irving Fields also recorded "Bikinis and Bongos" and "Pizzas and Bongos" - if anyone has these, please do share! Here's one I've had for quite awhile. A couple of years ago I posted Cheryl Ladd's first album, so here's the other album of hers that I have. Cheryl Ladd, of course, was "Kris Munroe" on the TV show "Charlie's Angels", and later became a fixture on the Lifetime channel TV movies. I only recently found out that her daughter, Jordan Ladd, attended SMU here in Dallas some years back. I wish I had known at the time. Maybe I could've caught a glimpse of Cheryl at the Galleria or something. Oh, well. Anyway, about the album... if you're a Cheryl Ladd fan or like celebrity vocals, you should like this one. I think I liked the first one better though, although she looks awfully cute on this cover! Oh, and one of the songs from this album was in my first podcast episode!